One Island. One Family. A Million Zombies. One HELL Of An Adventure. Trapped aboard a ferry destined for their new life in the Philippines, the Robinsons learn of an virus sweeping the planet. Early symptoms include a hacking cough, shortness of breath, and deathly pale skin. The exact same symptoms shared by a fellow passenger. Can they escape? Or are they doomed to sail the seas as undead for all time? The classic tale, inspired by Robinson Crusoe, written by Johann David Wyss, adapted by Perrin Briar, is an adrenalin-pumping adventure of zombie survival. If your family was trapped on a doomed ship, what would you do? From the writer who brought you the Blood Memory series and The Swiss Family RobinZOM comes this powerful first part in a new zombie series. 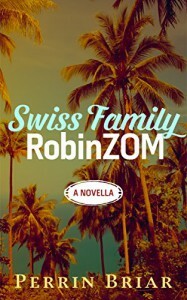 THE SWISS FAMILY ROBINZOM. Let the horror begin. Q - What made you decide to give the first book away free? A – I wanted to gift a free zombie book to everyone who enjoys the horror genre. I’m a new writer and it’s great knowing that someone out there is reading and enjoying my novel. There’s no greater feeling than that… Except perhaps for a good scare! Q - Can readers get the whole series in one go? A – The series is going to be very long, so I’ve bundled the books up into packs of four at a discounted rate on Amazon. I'm on chapter 7 and I'm loving Book 1 so far! !